By now you probably know that custom challenge coins can be made in any form, shape, size or finish. 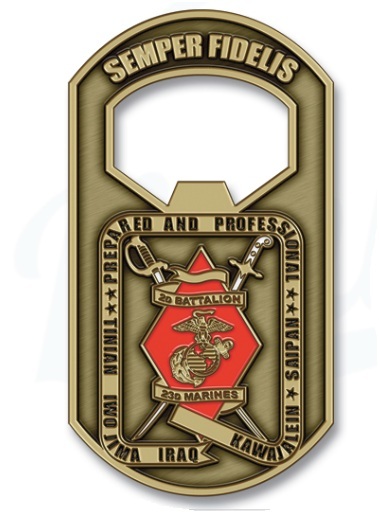 Did you know that many of our custom coins are also minted as challenge coin bottle openers? As military challenge coins spread to more private applications – as giveaways, rewards, membership icons – our customers are looking for new and innovative ways to make their coins functional and unique. One way is to have a piece made that actually serves as a bottle opener. They are quite the conversation starter! Our artists are highly trained – not only in design – but the actual mechanics of what makes a challenge coin bottle opener function. We have seen too many times companies attempt to manufacture a custom coin bottle opener using improper design specifications. A likeness would be making a tool which is flawed in design and doesn’t do the job its intended to do. Many factors come into play with such custom pieces, including bevel, thickness and opening width. 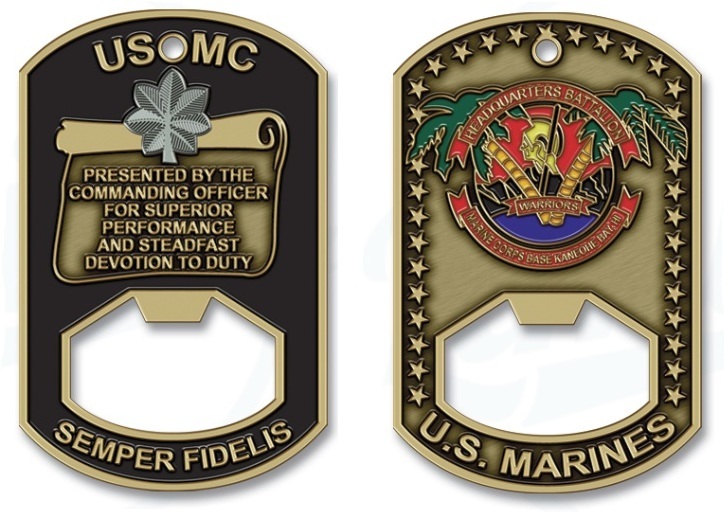 With all this in mind, our customers know that Challenge Coins Limited is an industry leader in custom coins – to include special function items like bottle openers. We take your logo and form it into a coin that will open any bottle, any time, over and over again without fail. Some people don’t actually use their coins to crack open a beer, but simply as a display piece – and that’s fine too…but you can rest assured that it will do its intended job if called upon. 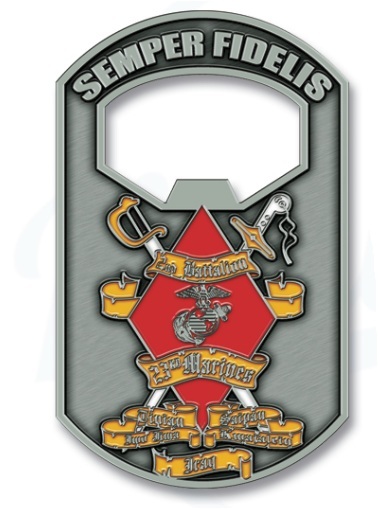 We can produce as little as fifty (50) custom challenge coin bottle openers at your request. We offer completely free design work before you pay us a single penny. We want you to be ecstatic with your coins before you submit payment…it’s just how we do things. Our team of six expert artists collaborates on a regular basis to offer our customers the latest in design trends and techniques. What this all means to you is once your coins arrive, your smile will be as wide as the State of Texas. 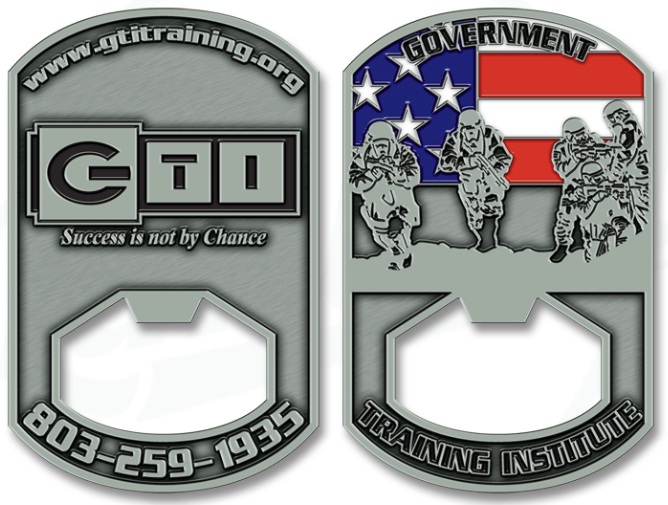 Give us a call today at 1-800-818-3229 – we make ordering challenge coins of ANY type very easy.